Substandard medicines could be three times more prevalent than the government says, two new studies show. These data have serious implications on health in a country where 58.2 per cent of the total health expenditure is an out-of-pocket cost burden on people, according to the World Health Organization, and where medicines alone account for between 70 per cent and 77 per cent of health spending. Substandard drugs work less effectively, causing disease to run a longer course, and can even require a new prescription during treatment. 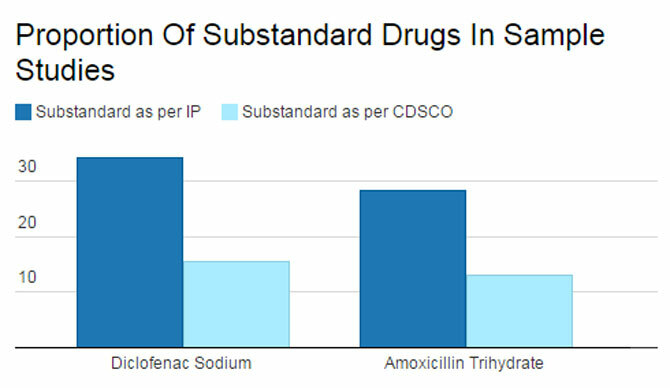 Substandard drugs also contribute to antibacterial resistance, a threat that has doubled in the last five years in India. 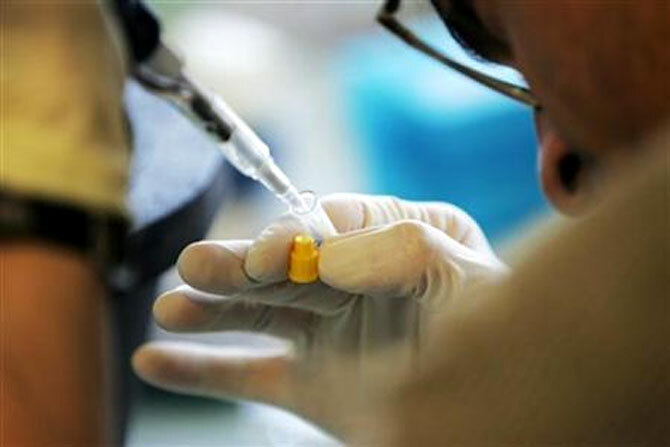 About 4.5 per cent of the drugs in the Indian market are substandard, according to surveys by the Central Drug Standard Control Organisation (CDSCO), the official regulatory authority. Experts believe that more lucrative routinely prescribed drugs are at higher risk of failing quality standards, as this new study, published in the December 2015 Journal of Applied Pharmaceutical Science, concluded, after testing 32 samples of diclofenac sodium, a popular pain killer. A second study, published in 2016 in the International Journal of Pharmacy and Pharmaceutical Sciences, evaluated 46 samples of amoxicillin trihydrate, a fast-moving antibiotic. 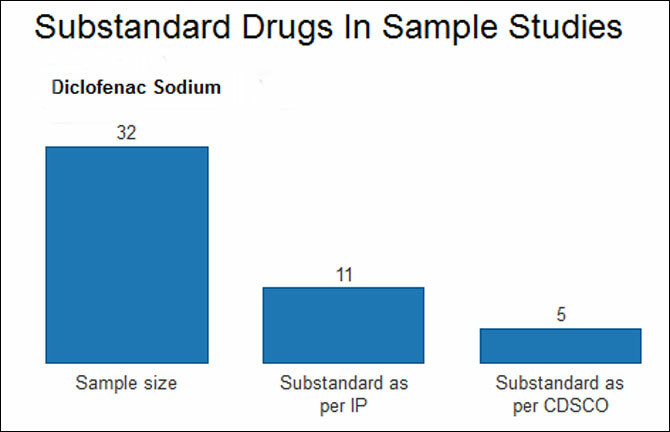 “We found a substandard medicine incidence of 15.62 per cent for diclofenac sodium and 13.04 per cent for amoxicillin trihydrate,” said Ahmed Nawaz Khan, study co-author and assistant professor, Department of Pharmacy, Jaypee University of Information Technology, Solan. Even some higher-priced medicines from reputed sellers failed to measure up. “This is sad because many consumers shell out more for reputed brands, believing those products are better,” said Khan. To make the grade, a tablet must contain between 90 per cent and 110 per cent of the active ingredient named on the label, according to the Indian Pharmacopoeia Commission, an autonomous Indian health ministry institution. However, the CDSCO offers a 5 per cent grace margin on that lower limit, a leeway Khan called ‘needless’. If the more stringent Indian Pharmacopoeia specification was made the yardstick for quality, twice the number of samples of Khan’s study would fall short. The implications of this finding: “Borderline quality suggests a lack of quality control,” said Khan. Government surveys reveal a falling incidence of substandard and spurious drugs in the Indian market - from about 9 per cent in the mid 1990s, as this 2015 International Journal of Pharmacy and Pharmaceutical Sciences study cited, to 4.5 per cent in recent years. 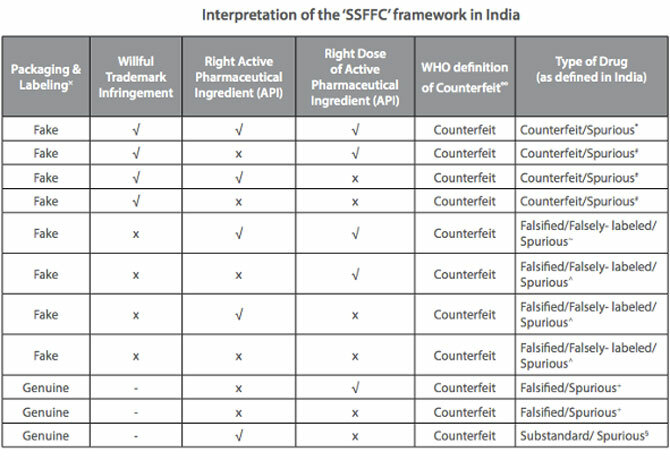 Spurious medicines alone, distinguishable from substandard products for being imitations of (usually) popular branded drugs, with ingredients that may or may not match their label, make up a negligible part of the Indian drug market as per the CDSCO - 0.046 per cent according to its 2009 Report on Countrywide Survey for Spurious Drugs and 0.11 per cent, according to last year’s regular sampling. One The Economic Times report in 2003 said according to WHO, 35 per cent of counterfeit drugs supplied worldwide come from India. Subsequently, the WHO said it had been misquoted, and continues to maintain that “it has not undertaken any survey to map the extent of spurious drugs in the Indian market”. 25 per cent of medicines sold in India are fake, counterfeit or substandard, said the 2014 Fake and Counterfeit Drugs in India - Booming Biz report by industry body ASSOCHAM, before retracting the study because of “some errors in the projections”, an ASSOCHAM communication representative told this reporter. Last year, the CDSCO tested 74,199 samples across the country, a 150 per cent increase in sample size over 2012. However, that is still a drop in the ocean for the world’s third-largest pharmaceutical market by volume - India consumes 383 billion medicines per annum, according to this 2015 report, but details of the manufacturing units producing those tablets are virtually unavailable. “There is no consolidated national list of manufacturers or total number of licenses granted, which makes it difficult to devise any concrete national or state policy for the regulation of this sector,” said this 2015 Indian Council for Research on International Economic Relations (ICRIER) report. “Without digitised lists of manufacturers, licenses granted and inspections, annual sampling by the CDSCO is too limited and unstructured,” said Bejon Misra, a consumer policy expert and founder, Safe Medicines India, an industry watchdog. All that the CDSCO has handy, by way of digital lists, is monthly drug alerts enumerating samples that failed tests. It is unclear who reads these lists. 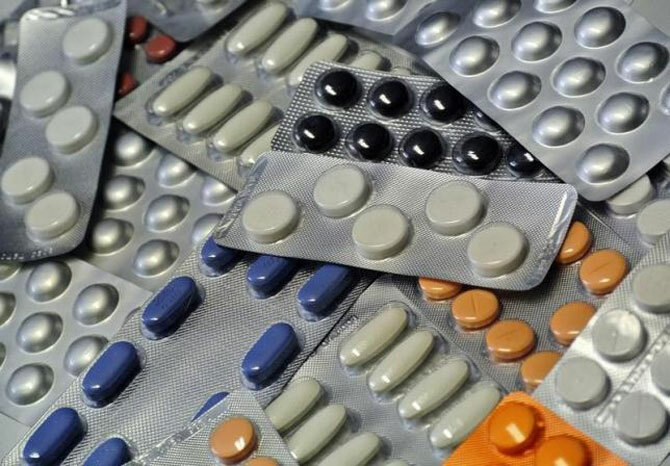 “We withdrew the entire batch from the market, investigated the cause, found a quality issue with the intermediate used as the binding agent for the tablet, and have since taken corrective action,” said director Girdharilal Jadwani. We have contested the notice for the inaccurate description and assay of two batches of our syrup, by supplying the authority an in-house laboratory report and a report from an ‘unbiased’ government laboratory. 'Faulty machine compression setting’ caused the deficiency in the uniformity of weight, dissolution and assay of our tablet. Inappropriate storage after the tablet leaves the factory caused the lack of uniformity of weight of the sample. We have introduced an additional test during manufacturing to ensure our product conforms to standards. One manufacturer disconnected, as soon as this reporter explained the reason for the call. Partial suspension of manufacturing by a company with unscrupulous intentions also may not comfort consumers. Last July, drug-control authorities in Punjab raided the premises of a manufacturer and seller of spurious hydroxyprogestrone caproate injections, a hormone prescribed to lower the risk of preterm delivery. As for a conviction, not much has happened in the six months since the story made headlines. “The manufacturer has responded to the legal notice asking for a re-test in the Central Drugs Laboratory Kolkata, which takes time because the laboratory is overloaded,” said Singh, who believes loopholes in the current system for producing evidence against unscrupulous manufacturers need to be plugged. “State drug regulatory authorities have given out licenses left, right and centre. But the rise in the number of manufacturing units and products hasn’t been matched by expanded testing capacity,” said Khan. “We filed FIRs against all the chemists involved; the police are investigating, albeit slower than desired, perhaps due to being overworked,” said Singh. For instance, PharmaSecure, a global provider of verification technology for pharmaceutical companies, generates a unique alphanumeric code for a strip of medicines, printed on the package directly or applied via scratch-off labels or holographic labels, pasted on the packaging line. Consumers buying the medicine can inquire - via SMS, mobile app or online - whether the code, and therefore the medicine, is genuine or not. On the day this report was written, PharmaSecure was tracking a situation with the makings of a scam. “We have been receiving 15 inquiries a day, for the last couple of weeks, to verify one single code, and these inquiries have poured in from across India,” said Yadav. 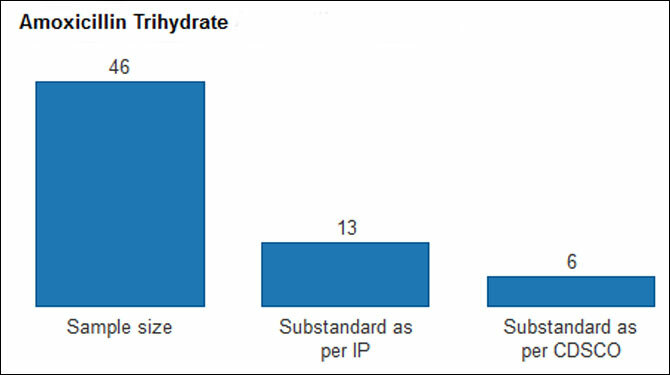 After analysing those interactions, PharmaSecure was passing on the data to brand owners for further investigation. “At worst, the situation would mean that an unscrupulous manufacturer has produced an imitation product bearing the labelling - code included - of one genuine packet of the medicine in question,” said Yadav. The government’s stand is that verification technology is expensive for small firms. Misra believes low adoption reflects “a general unwillingness to be transparent about products, so, verification technology must be made mandatory”. 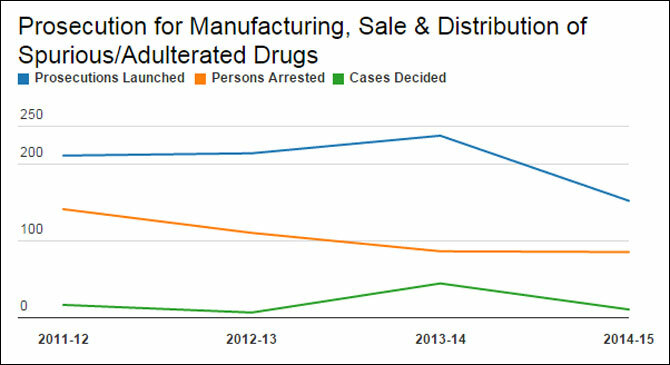 The bottom line: India’s substandard-drug problem can be solved. Will crude oil price crash to $10 a barrel?